Home > Multimedia Australia Pty. Ltd.
Found 6 file extension associations related to BestAddress HTML Editor and 3 file formats developed specifically for use with BestAddress HTML Editor. Developer: Multimedia Australia Pty. Ltd.
BestAddress HTML Editor is used to create web pages and internet applications. It supports to edit HTML, CSS and PHP languages. It includes DigitalAccess FTP, so users can upload your files to the Web without needing to buy additional FTP software. Create your websites with this multi-award-winning Web design and development software program, used by Web authors for over 6 years! 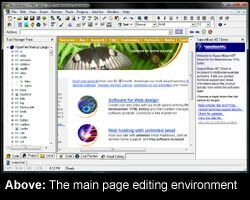 With three editing mode options: visual editing (also known as WYSIWYG), code editing (HTML, CSS and PHP) and split-screen preview and code editing functionality - it's like having three HTML editors in one! Unlike many other HTML editors, the BestAddress HTML Editor even includes DigitalAccess FTP, so you can upload your files to the Web without needing to buy additional FTP software. If you need more information please contact the developers of BestAddress HTML Editor (Multimedia Australia Pty. Ltd.), or check out their product website.